Angel's Trumpet (Brugmansia) is also known as Angel's Tears. 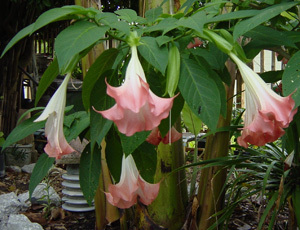 This plant produces abundant nine inch hanging trumpet shaped blooms in shades of white and various pastels. The blooms tend to come on all at once and are wonderfully fragrant in the evening. They soon vanish until the next flourish of blooms appears again in a month or so. This plant can be kept as a small garden bush, or it can grow to tree of up to 18 feet high. Best blooming results come from a full sun location. Propagation is made from easily rooted cuttings or from seed. This plant is native to Brazil, Chile and Peru and is not salt tolerant. It is VERY POISONOUS and hallucinogenic, but also quite beautiful when in full bloom. My first introduction of these large exotic plants was in the greenhouses of the Atlanta Botanical Gardens back when I used to volunteer my services there. They were quite spectacular even in that cramped setting.